Over 90% of American homes have microwave ovens used for meal preparation. Because microwave ovens are so convenient and energy efficient, as compared to conventional ovens, very few homes or restaurants are without them. In general, people believe that whatever a microwave oven does to foods cooked in it doesn’t have any negative effect on either the food or them. Of course, if microwave ovens were really harmful, our government would never allow them on the market, would they? Would they? Regardless of what has been “officially” released concerning microwave ovens, we have personally stopped using ours based on the research facts outlined in this article. The purpose of this report is to show proof – evidence – that microwave cooking is not natural, nor healthy, and is far more dangerous to the human body than anyone could imagine. However, the microwave oven manufacturers, Washington City politics, and plain old human nature are suppressing the facts and evidence. Because of this, people are continuing to microwave their food – in blissful ignorance – without knowing the effects and danger of doing so. Microwaves are a form of electromagnetic energy, like light waves or radio waves, and occupy a part of the electromagnetic spectrum of power, or energy. In our modern technological age, microwaves are used to relay long distance telephone signals, television programs, and computer information across the earth or to a satellite in space. But the microwave is most familiar to us as an energy source for cooking food. Every microwave oven contains a magnetron, a tube in which electrons are affected by magnetic and electric fields in such a way as to produce micro wavelength radiation at about a 1010 cycles per second, or Hertz (see below for definitions). This microwave radiation interacts with the molecules in food. All wave energy changes polarity from positive to negative with each cycle of the wave. In microwaves, these polarity changes happen millions of times every second. Food molecules – especially the molecules of water – have a positive and negative end in the same way a magnet has a north and a south polarity. When anyone microwaves food, the oven exerts a power input of about 1000 watts of alternating current, or more. As these microwaves generated from the magnetron bombard the food, they cause the polar molecules to rotate at the same frequency millions of times a second. All this agitation creates molecular friction, which heats up the food. The friction also causes substantial damage to the surrounding molecules, often tearing them apart or forcefully deforming them. The scientific name for this deformation is “structural isomerism”. By comparison, microwaves from the sun are based on principles of pulsed direct current (DC) that don’t create frictional heat; microwave ovens use alternating current (AC) creating frictional heat. Radiation, as defined by physics terminology, is “the electromagnetic waves emitted by the atoms and molecules of a radioactive substance as a result of nuclear decay.” Radiation causes ionization, which is what occurs when a neutral atom gains or loses electrons. In simpler terms, a microwave oven decays and changes the molecular structure of the food by the process of radiation. Had the manufacturers accurately called them “radiation ovens”, it’s doubtful they would have ever sold one, but that’s exactly what a microwave oven is. 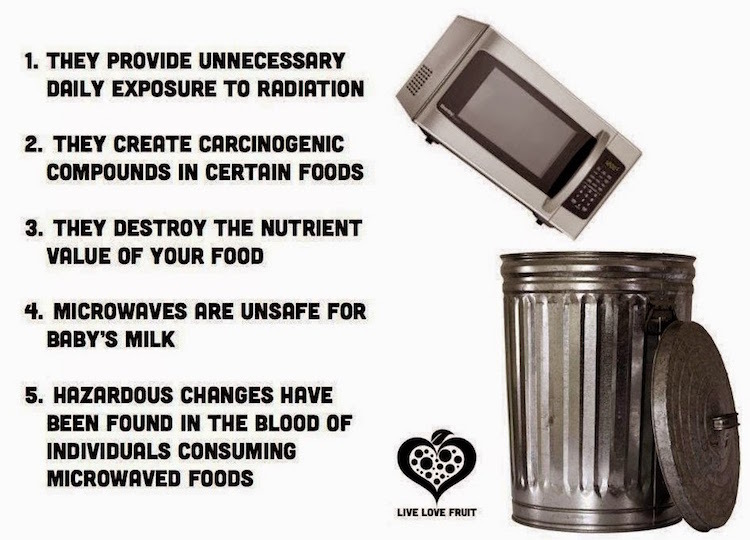 We’ve all been told that microwaving food is not the same as irradiating it (radiation “treatment”). The two processes are supposed to use completely different waves of energy and at different intensities. No FDA or officially released government studies have proven current microwaving usage to be harmful, but we all know that the validity of studies can be – and are sometimes deliberately – limiting. Many of these studies are later proven to be inaccurate. As consumers, we’re supposed to have a certain degree of common sense to use in judgment. Take the example of eggs and how they were “proven” to be so harmful to our health in the late 1960’s. This brought about imitation egg products and big profits for the manufacturers, while egg farms went broke. Now, recent government sponsored studies are saying that eggs are not bad for us after all. So, whom should we believe and what criteria should we use to decide matters concerning our health? Since it’s currently published that microwaves – purportedly – don’t leak into the environment, when properly used and with approved design, the decision lies with each consumer as to whether or not you choose to eat food heated by a microwave oven or even purchase one in the first place. On a more humorous side, the “sixth sense” every mother has is impossible to argue with. Have you ever tried it? Children will never win against a mother’s intuition. It’s like trying to argue with the arm – appearing out of nowhere – that pinned you to the back of the seat when your mother slammed on the brakes. Many of us come from a generation where mothers and grandmothers have distrusted the modern “inside out” cooking they claimed was “not suitable” for most foods. My mother refused to even try baking anything in a microwave. She also didn’t like the way a cup of coffee tasted when heated in a microwave oven. I have to fully agree and can’t argue either fact. Her own common sense and instincts told her that there was no way microwave cooking could be natural nor make foods “taste they way they’re supposed to”. Reluctantly, even my mother succumbed to re-heating leftovers in a microwave due to her work schedule before she retired. Many others feel the same way, but they’re considered an “old fashioned” minority dating back to before the 1970’s when microwaves first overwhelmed the market. Like most young adults at the time, as microwave ovens became commonplace, I chose to ignore my mother’s intuitive wisdom and joined the majority who believed microwave cooking was far too convenient to ever believe anything could be wrong with it. Chalk one up for mom’s perception, because even though she didn’t know the scientific, technical, or health reasons why, she just knew that microwave ovens were not good based on how foods tasted when they were cooked in them. She didn’t like the way the texture of the microwaved food changed either. In 1991, there was a lawsuit in Oklahoma concerning the hospital use of a microwave oven to warm blood needed in a transfusion. The case involved a hip surgery patient, Norma Levitt, who died from a simple blood transfusion. It seems the nurse had warmed the blood in a microwave oven. This tragedy makes it very apparent that there’s much more to “heating” with microwaves than we’ve been led to believe. Blood for transfusions is routinely warmed, but not in microwave ovens. In the case of Mrs. Levitt, the microwaving altered the blood and it killed her. It’s very obvious that this form of microwave radiation “heating” does something to the substances it heats. It’s also becoming quite apparent that people who process food in a microwave oven are also ingesting these “unknowns”. Because the body is electrochemical in nature, any force that disrupts or changes human electrochemical events will affect the physiology of the body. This is further described in Robert O. Becker’s book, The Body Electric, and in Ellen Sugarman’s book, Warning, the Electricity Around You May Be Hazardous to Your Health. “A basic hypothesis of natural medicine states that the introduction into the human body of molecules and energies, to which it is not accustomed, is much more likely to cause harm than good. Microwaved food contains both molecules and energies not present in food cooked in the way humans have been cooking food since the discovery of fire. Microwave energy from the sun and other stars is direct current based. Artificially produced microwaves, including those in ovens, are produced from alternating current and force a billion or more polarity reversals per second in every food molecule they hit. Production of unnatural molecules is inevitable. Naturally occurring amino acids have been observed to undergo isomeric changes (changes in shape morphing) as well as transformation into toxic forms, under the impact of microwaves produced in ovens. Dr. Hertel was the first scientist to conceive and carry out a quality clinical study on the effects microwaved nutrients have on the blood and physiology of the human body. His small, but well controlled, study showed the degenerative force produced in microwave ovens and the food processed in them. The scientific conclusion showed that microwave cooking changed the nutrients in the food; and, changes took place in the participants’ blood that could cause deterioration in the human system. Hertel’s scientific study was done along with Dr. Bernard H. Blanc of the Swiss Federal Institute of Technology and the University Institute for Biochemistry. “Leukocytosis, which cannot be accounted for by normal daily deviations, is taken very seriously by hemotologists. Leukocytes are often signs of pathogenic effects on the living system, such as poisoning and cell damage. The increase of leukocytes with the microwaved foods were more pronounced than with all the other variants. It appears that these marked increases were caused entirely by ingesting the microwaved substances. “This process is based on physical principles and has already been confirmed in the literature. The apparent additional energy exhibited by the luminescent bacteria was merely an extra confirmation. There is extensive scientific literature concerning the hazardous effects of direct microwave radiation on living systems. It is astonishing, therefore, to realize how little effort has been taken to replace this detrimental technique of microwaves with technology more in accordance with nature. Technically produced microwaves are based on the principle of alternating current. Atoms, molecules, and cells hit by this hard electromagnetic radiation are forced to reverse polarity 1-100 billion times a second. There are no atoms, molecules or cells of any organic system able to withstand such a violent, destructive power for any extended period of time, not even in the low energy range of milliwatts. The same violent deformations that occur in our bodies when we are directly exposed to radar or microwaves also occur in the molecules of foods cooked in a microwave oven. This radiation results in the destruction and deformation of food molecules. Microwaving also creates new compounds, called radiolytic compounds, which are unknown fusions not found in nature. Radiolytic compounds are created by molecular decomposition – decay – as a direct result of radiation. Microwave oven manufacturers insist that microwaved and irradiated foods do not have any significantly higher radiolytic compounds than do broiled, baked or other conventionally cooked foods. The scientific clinical evidence presented here has shown that this is simply a lie. Neither universities nor the federal government have conducted any tests concerning the effects on our bodies from eating microwaved foods. Isn’t that a bit odd? They’re more concerned with studies on what happens if the door on a microwave oven doesn’t close properly. Once again, common sense tells us that their attention should be centered on what happens to food inside a microwave oven. Since people ingest this altered food, shouldn’t there be concern for how the same decayed molecules will affect our own human biological cell structure? As soon as Doctors Hertel and Blanc published their results, the authorities reacted. A powerful trade organization, the Swiss Association of Dealers for Electro-apparatuses for Households and Industry, known as FEA, struck swiftly in 1992. They forced the President of the Court of Seftigen, Canton of Bern, to issue a “gag order” against Drs. Hertel and Blanc. In March 1993, Dr. Hertel was convicted for “interfering with commerce” and prohibited from further publishing his results. However, Dr. Hertel stood his ground and has this decision over the years. Finally, in 1998, the decision was reversed in a judgment delivered in Strasbourg, Austria, on August 25, 1998. The European Court of Human Rights held that there had been a violation of Hertel’s rights in the 1993 decision. The European Court of Human Rights also ruled that the “gag order” issued by the Swiss court in 1992 against Dr. Hertel, prohibiting him from declaring that microwave ovens are dangerous to human health, was contrary to the right to freedom of expression. In addition, Switzerland was ordered to pay Dr. Hertel compensation. The Nazis, for use in their mobile support operations, originally developed microwave radiomissor cooking ovens to be used for the invasion of Russia. By being able to utilize electronic equipment for preparation of meals on a mass scale, the logistical problem of cooking fuels would have been eliminated, as well as the convenience of producing edible products in a greatly reduced time-factor. After the war, the Allies discovered medical research done by the Germans on microwave ovens. These documents, along with some working microwave ovens, were transferred to the United States War Department and classified for reference and “further scientific investigation.” The Russians had also retrieved some microwave ovens and have thorough research on their biological effects. As a result, their use was outlawed in the Soviet Union. The Soviets issued an international warning on the health hazards, both biological and environmental, of microwave ovens and similar frequency electronic devices. Other Eastern European scientists also reported the harmful effects of microwave radiation and set up strict environmental limits for their usage. The United States has not accepted the European reports of harmful effects, even though the EPA estimates that radio frequency and microwave radiation sources are increasing at 15% per year. In Dr. Lita Lee’s book, Health Effects of Microwave Radiation – Microwave Ovens, and in the March and September 1991 issues of Earthletter, she stated that every microwave oven leaks electro-magnetic radiation, harms food, and converts substances cooked in it to dangerous organ-toxic and carcinogenic products. 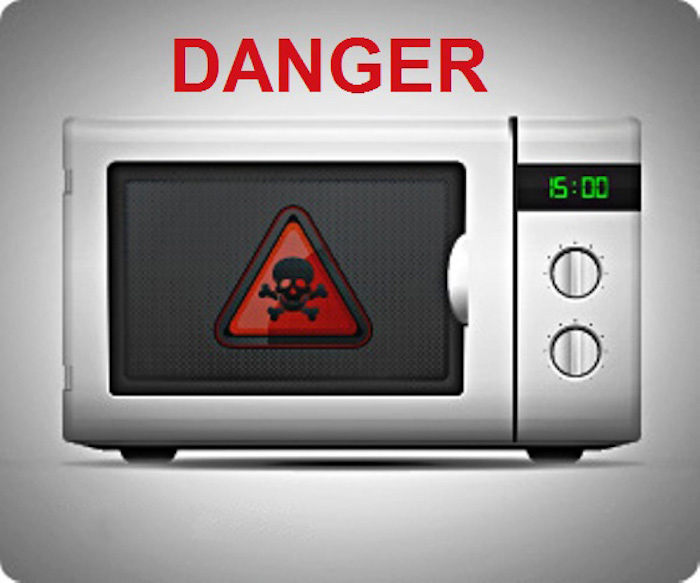 Further research summarized in this article reveal that microwave ovens are far more harmful than previously imagined. Microwaving milk and cereal grains converted certain of their amino acids into carcinogens. The Russians did research on thousands of workers who had been exposed to microwaves during the development of radar in the 1950’s. Their research showed health problems so serious that the Russians set strict limits of 10 microwatts exposure for workers and one microwatt for civilians. 11. In a statistically high percentage of persons, microwaved foods caused stomach and intestinal cancerous growths, as well as a general degeneration of peripheral cellular tissues, with a gradual breakdown of the function of the digestive and execrative systems. 2). The human body cannot metabolize (break down) the unknown by-products created in microwaved food. 4). The effects of microwaved food by-products are residual (long term, permanent) within the human body. 7). Microwaved foods cause stomach and intestinal cancerous growths (tumors). This may explain the rapidly increased rate of colon cancer in America. [The use of artificial microwave transmissions for subliminal psychological control, a.k.a. “brainwashing”, has also been proven. We’re attempting to obtain copies of the 1970’s Russian research documents and results written by Drs. Luria and Perov specifying their clinical experiments in this area].